This analogue high voltage isolation meter is equipped with adjustable high voltages of 100 V, 250 V, 500 V, 1000V (according to EN 61 557 part 1) and 1500 V, 2000 V, 2500 V, 5000 V. This isolation meter is a standard isolation resistant measuring device or as a detector for breakdown at electric lines (on machines, transformers, cables as well as electric facilities, e.g. locomotives, trams, vessels). The high voltage isolation meter can also be used to check isolator panels, compound material and synthetic panels on isolation resistance for respective electric conductivity of different construction materials. The maximum isolation meter can be read at the analogue display. By means of voltage measuring ranges the zero potential of test objects in networks up to 2 kV can be determined. This is important in terms of isolation resistance detection since external voltages falsify the measuring data. Capacitive test objects, e.g. 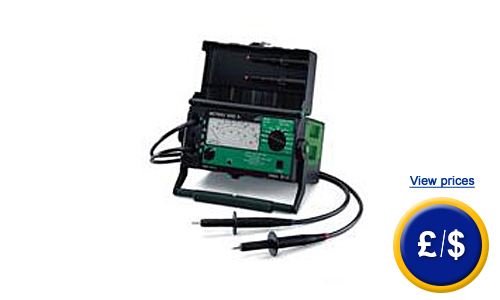 cables and windings that can be charged on the test voltage, will discharge due to this high voltage isolation meter. Therefore the descent of the voltage can directly be monitored due to needle deflection at the meter. The highly isolated measuring lines are plumbed for safety- and measuring- related causes. Thus an endangerment by accidental pulling the cable, e.g. during recharge through capacitive test objects, can be avoided. If you have questions concerning the high voltage isolation meter, please take a look at the following technical data or call or hotline: UK customers +44(0) 23 809 870 30 / US customers +1-410-387-7703. Our technicians and engineers will gladly advise you regarding the high voltage isolation meter or any other product in terms of regulation and control or scales and balances by PCE Instruments. - Isolation measuring is performed in a voltage free state. before measurement and measure from feeding. - If the measuring-circuit contains a capacitive consumer load, discharge after measurement. isolation errors between the active lines. - In case of retest always measure L+N against PE (protection of electronic operation equipment). - In case of TN- systems open N-PE-bridge, in TT-system disconnect neutral conductor. C) those are to isolate earth-face whilst isolation measurement. In case of device protection, e.g. socket (requirement class D) - this procedure is not necessary. - In case of repeating tests with connected operation devices ~ 300 kΩ. Here you will find an overview of all the measuring instruments available at PCE Instruments. in Turkish in Polish in Russian in Dutch in Portuguese .